I’m not particularly proud of it. But it happened. I shared fake news. No, rather, I created the fake news. Then spread it. Some friends and I share an iMessage group where we occasionally speculate on cryptocurrencies. In the past few days, we’ve been closely watching the price of Ripple. My friends consumed this news without question, because, why would I make that up? It’s easily verifiable. Later in the morning, after a little caffeine begins pumping through my bloodstream, I revisit the tweet and actually watch the video. Well I’ll be damned. Turns out, this wasn’t a Jimmy Kimmel thing. 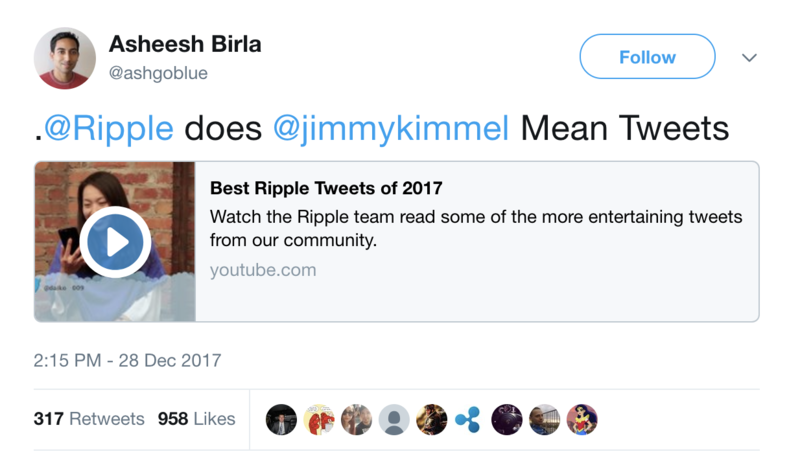 Instead, the Ripple team just recorded their own “Jimmy Kimmel style” video in their own office of employees reading mean tweets. I felt like a fool. I wasn’t sure whether to be upset at myself or the tweet author. It’s hard to tell whether his intention was to deceive (he is himself an employee of Ripple). But, obviously I was at fault. I shared meaningful news without verifying it in the slightest. The damage done was minor, but imagine if I had just a smidgen more of real influence—I could have really affected the perception of Ripple, and thus its price. Having seen friends and family in the past share fake news accidentally, the behavior seems difficult to avoid, given the amount of content available and our lack of time to parse it all. So we go by headlines, and share them off, because why would a headline deceive us, right? It’s hard to say whether I learnt any true valuable lesson. My time available to verify all content as it streams past my eyes will only continue to deplete as more content is created. So, the time vs. content verification problem gets more difficult every day. This post is just to say, it can happen to you. You can spread fake news even with the best of intentions.